DyeLab modular carpet reinterprets ancient wash and dye techniques, resulting in irregular and organic patterns in natural colors. Cradle to Cradle Silver Certified and uses Eco Solution Q fiber with 45 percent recycled content. 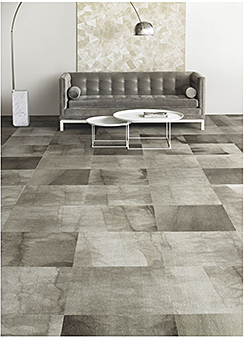 All tiles feature EcoWorx backing, which is completely recyclable, PVC-free, and contain 44 percent recycled content.